Have you secured a DJ for your upcoming wedding? Have you interviewed candidates? Here are seven important questions you’ll want answers to before you sign on the dotted line. 1. What are some of your favorite events you’ve worked? This is a great opener because it does a couple of things. First, it gives you a chance to see the personality of the DJ you are hiring, who may very well be the person who sets the tone of the event as MC. Also, it gives you an indication of the DJ’s experience and at various venues and with mixed-age crowds. But it also allows you to see if this person loves their job because that’s something that will come through the day of your event. 2. Have you ever worked at the venue we’ve reserved? Your candidate may have insight on parking, acoustics, equipment needs, lighting, linens. Are they providing linens or are you? Is there an extra fee if they provide them? A professional should be able to work any size or venue and know what extras are needed, but it’s good to know going in what everything will cost you so there are no surprises. 3. What do you see as your role? It’s helpful to be on the same page here. 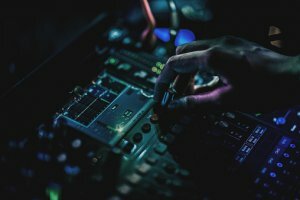 If you’re looking for a DJ who will essentially MC the event, from making introductions to keeping things moving along, but the candidate you interview is purely there to play the music, this may be a red flag. 4. Do we need to provide you with the songs? Do you take requests? What if there are songs you do not want to be played? It’s good to know upfront how this particular DJ handles song choices. Some DJs have pre-made mixes that cannot be interrupted. Ask what input you and your fiance will have. Make sure you communicate the genre you prefer, the formality and time of day the reception will occur, etc. 5. Are you able to DJ for the length of time we need? How do you charge? Some DJs charge by the hour and some by a range of time. Ask. Do they go on break at a certain time or is it continuous? What happens if you decide to continue the event beyond the original end time? Are they flexible? If you are paying by the hour, what about the time during the dinner? 6. What happens if you are sick or can’t attend my event for any reason? Do you have insurance? All vendors should have liability insurance. Accidents occur, and what you want to know is: does this DJ have a plan? Hopefully by now you have a good read on the DJ but it doesn’t hurt to take a look at online reviews and talk to a few previous clients. Of course nobody gives names out of dissatisfied customers, but it’s worth a shot. Feeling overwhelmed? Leave this to the pros. Consider partnering with a professional event planner such as Entertainment Unlimited who has vetted DJs for many weddings. This may be your first wedding, but we’ve been at it for years. Call Entertainment Unlimited today to ask all of your questions and gain a partner you can trust.